A curious robot almost completely straddles this rocky little planet. Of course, the planet is really Mars and the robot is the car-sized Curiosity Rover, posing over its recent drilling target in the Marias Pass area of lower Mount Sharp. 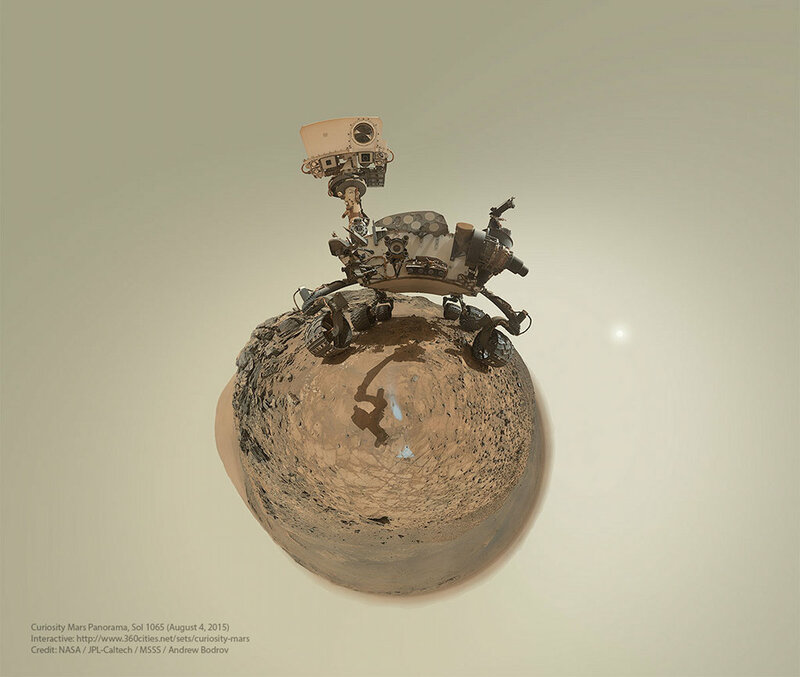 The 92 images used to assemble the little planet projection, a digitally warped and stitched mosaic covering 360x180 degrees, were taken by the rover's Mars Hand Lens Imager (MAHLI) during the Curiosity mission sol (martian day) 1065. That corresponds to 2015 August 5, three Earth years since Curiosity landed on the surface of the Red Planet. The composite selfie excludes images that show the rover's robotic arm and mount of the MAHLI camera itself, but their shadow is visible beneath. Check out this spectacular interactive version of Curiosity's sol 1065 panorama. On July 13th, a good place to watch Comet Jacques was from Venus. Then, the recently discovered visitor (C/2014 E2) to the inner solar system passed within about 14.5 million kilometers of our sister planet. But the outbound comet will pass only 84 million kilometers from our fair planet on August 28 and is already a fine target for telescopes and binoculars. Two days ago Jacques' greenish coma and straight and narrow ion tail were captured in this telescopic snapshot, a single 2 minute long exposure with a modified digital camera. 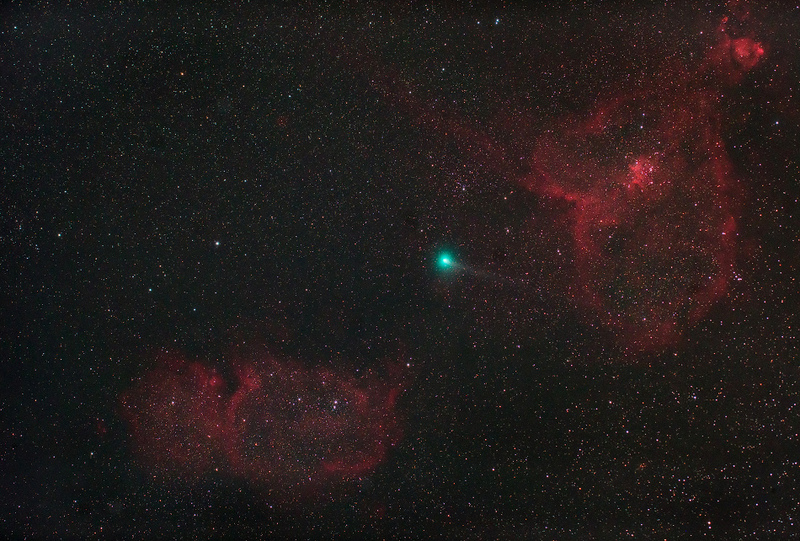 The comet is flanked by IC 1805 and IC 1848, also known as Cassiopeia's Heart and Soul Nebulae. If you're stuck on planet Earth this weekend you can hunt for Comet Jacques in evening skies, or spot a Venus, Jupiter, crescent Moon triangle before the dawn. The prominent ridge of emission featured in this dramatic skyscape is cataloged as IC 5067. Part of a larger emission nebula with a distinctive shape, popularly called The Pelican Nebula, the ridge spans about 10 light-years following the curve of the cosmic pelican's head and neck. This false color view also translates the pervasive glow of narrow emission lines from atoms in the nebula to a color palette made popular in Hubble Space Telescope images of star forming regions. Fantastic, dark shapes inhabiting the 1/2 degree wide field are clouds of cool gas and dust sculpted by the winds and radiation from hot, massive stars. 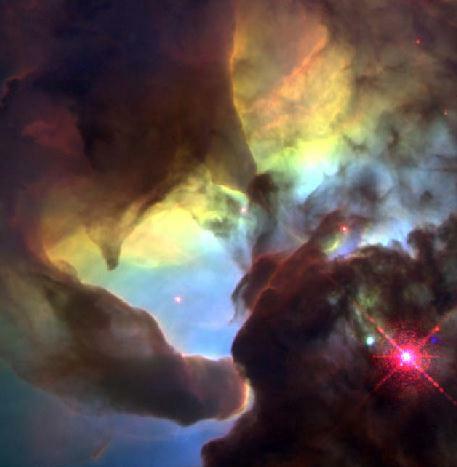 Close-ups of some of the sculpted clouds show clear signs of newly forming stars. 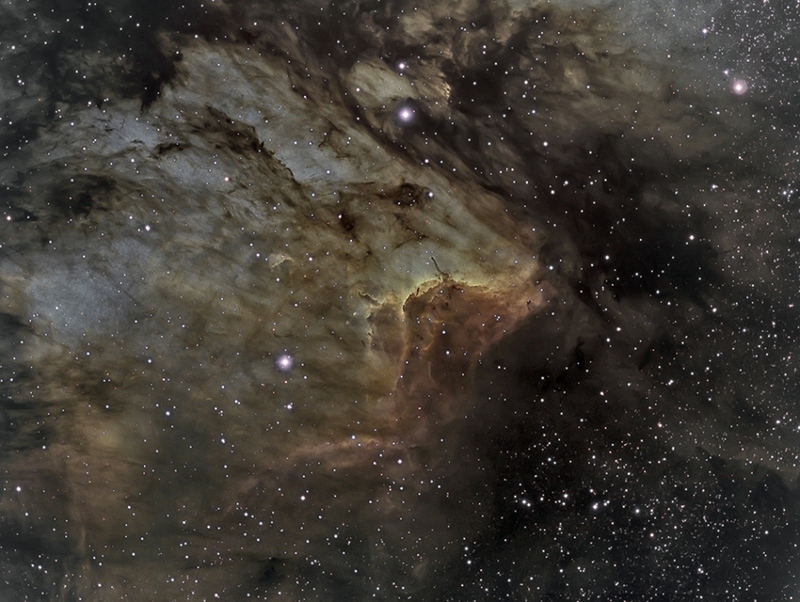 The Pelican Nebula, itself cataloged as IC 5070, is about 2,000 light-years away. To find it, look northeast of bright star Deneb in the high flying constellation Cygnus. Noctilucent or night-shining clouds lie near the edge of space. From about 80 kilometers above Earth's surface, the icy clouds can still reflect sunlight even though the Sun itself is below the horizon as seen from the ground. Usually occurring at high latitudes in summer months, the diaphanous apparitions are also known as polar mesospheric clouds and may be connected to global change in the lower atmosphere. 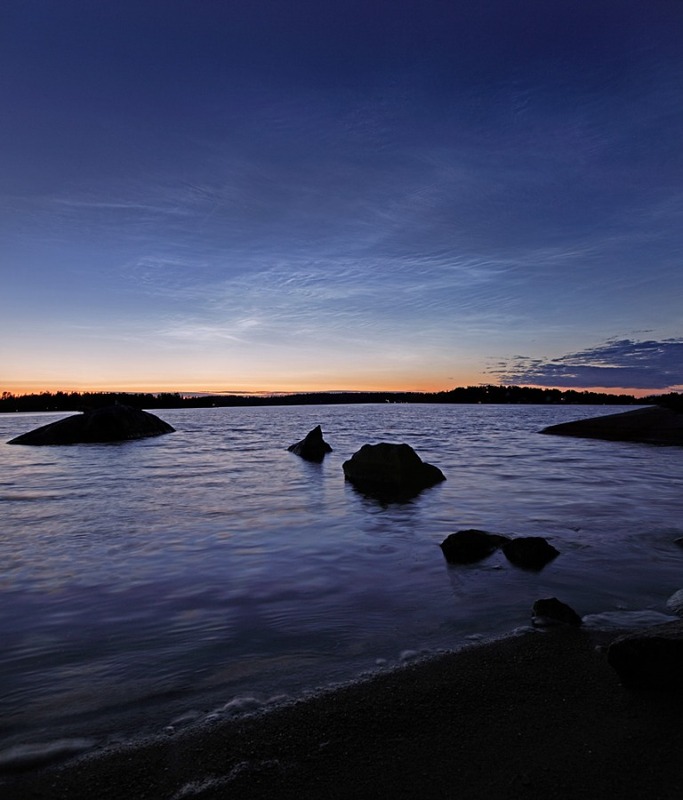 This serene view features a lovely display of noctilucent clouds over water recorded last month near the coastal town of Vaxholm, Sweden. The picture was taken near local midnight. Why is this planet so dark? Planet TrES-2b reflects back less than one percent of the light it receives, making it darker than any known planet or moon, darker even than coal. Jupiter-sized TrES-2b orbits extremely close to a sun-like star 750 light years away, and was discovered producing slight eclipses in 2006 using the modest 10-cm telescopes of the Trans-Atlantic Exoplanet Survey (TrES). 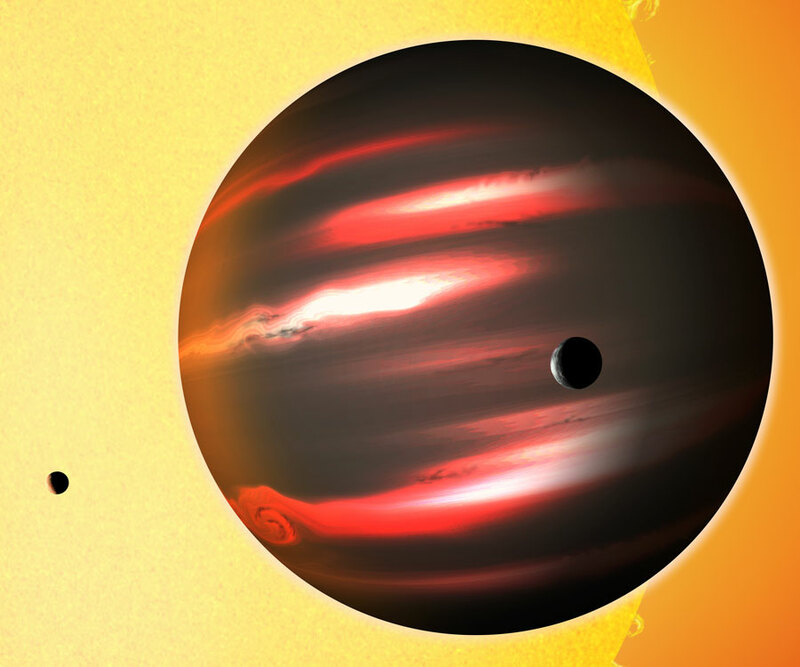 The alien world's strange darkness, however, was only uncovered recently by observations indicating its slight reflective glow by the Sun-orbiting Kepler satellite. An artist's drawing of planet is shown above, complete with unsubstantiated speculation on possible moons. Reasons for TrES-2b's darkness remain unknown and are an active topic of research. Is this one galaxy or two? This question came to light in 1950 when astronomer Art Hoag chanced upon this unusual extragalactic object. On the outside is a ring dominated by bright blue stars, while near the center lies a ball of much redder stars that are likely much older. Between the two is a gap that appears almost completely dark. How Hoag's Object formed remains unknown, although similar objects have now been identified and collectively labeled as a form of ring galaxy. Genesis hypotheses include a galaxy collision billions of years ago and the gravitational effect of a central bar that has since vanished. The above photo taken by the Hubble Space Telescope in July 2001 reveals unprecedented details of Hoag's Object and may yield a better understanding. 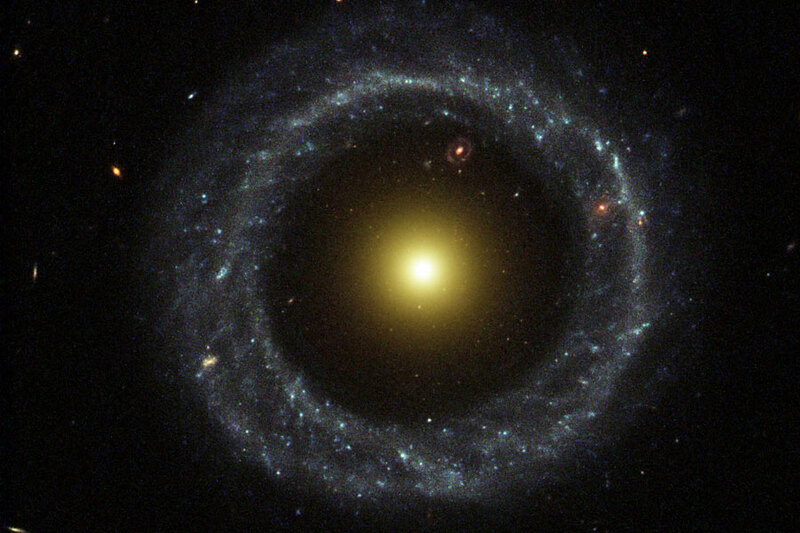 Hoag's Object spans about 100,000 light years and lies about 600 million light years away toward the constellation of the Snake (Serpens). Coincidentally, visible in the gap (at about one o'clock) is yet another ring galaxy that likely lies far in the distance. Named for Australian astronomer Colin Stanley Gum (1924-1960), The Gum Nebula is so large and close it is actually hard to see. In fact, we are only about 450 light-years from the front edge and 1,500 light-years from the back edge of this cosmic cloud of glowing hydrogen gas. Covered in this 41 degree-wide mosaic of H-alpha images, the faint emission region is otherwise easy to lose against the background of Milky Way stars. The complex nebula is thought to be a supernova remnant over a million years old, sprawling across the southern constellations Vela and Puppis. 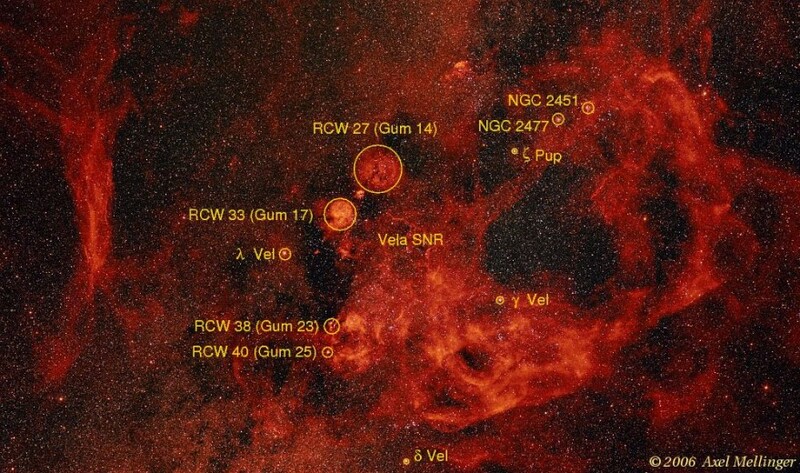 Sliding your cursor over this spectacular wide field view will reveal the location of objects embedded in The Gum Nebula, including the Vela supernova remnant. 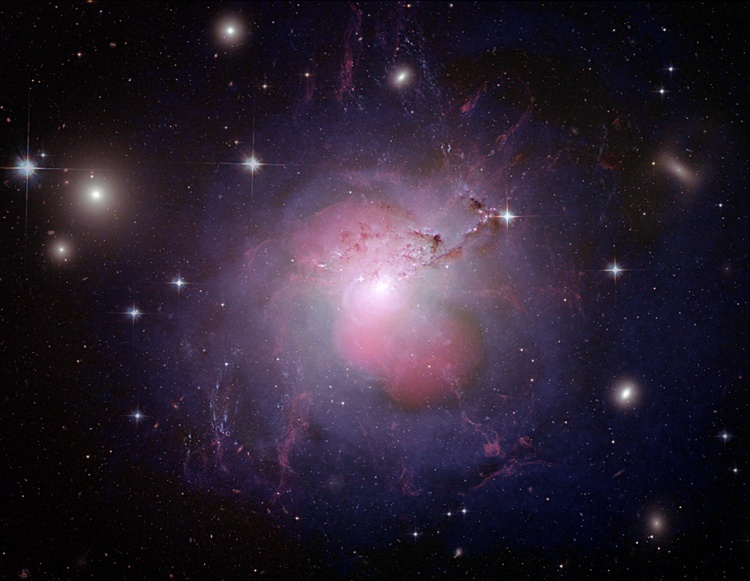 Active galaxy NGC 1275 is the central, dominant member of the large and relatively nearby Perseus Cluster of Galaxies. A prodigious source of x-rays and radio emission, NGC 1275 accretes matter as entire galaxies fall into it, ultimately feeding a supermassive black hole at the galaxy's core. This stunning visible light image from the Hubble Space Telescope shows galactic debris and filaments of glowing gas, some up to 20,000 light-years long. The filaments persist in NGC 1275, even though the turmoil of galactic collisions should destroy them. What keeps the filaments together? Recent work indicates that the structures, pushed out from the galaxy's center by the black hole's activity, are held together by magnetic fields. To add x-ray data from the Chandra Observatory and radio data from the Very Large Array to the Hubble image, just slide your cursor over the picture. In the resulting composite, x-rays highlight the shells of hot gas surrounding the center of the galaxy, with radio emission filling giant bubble-shaped cavities. Also known as Perseus A, NGC 1275 spans over 100,000 light years and lies about 230 million light years away. The largest, most violent star forming region known in the whole Local Group of galaxies lies in our neighboring galaxy the Large Magellanic Cloud (LMC). Were the Tarantula Nebula at the distance of the Orion Nebula -- a local star forming region -- it would take up fully half the sky. Also called 30 Doradus, the red and pink gas indicates a massive emission nebula, although supernova remnants and dark nebula also exist there. The bright knot of stars left of center is called R136 and contains many of the most massive, hottest, and brightest stars known. 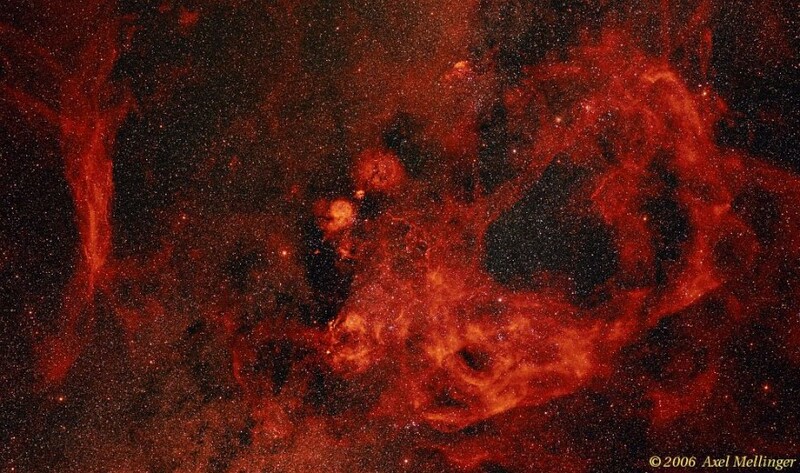 The above image taken with the European Southern Observatory's (ESO's) Wide Field Imager is one of the most detailed ever of this vast star forming region. 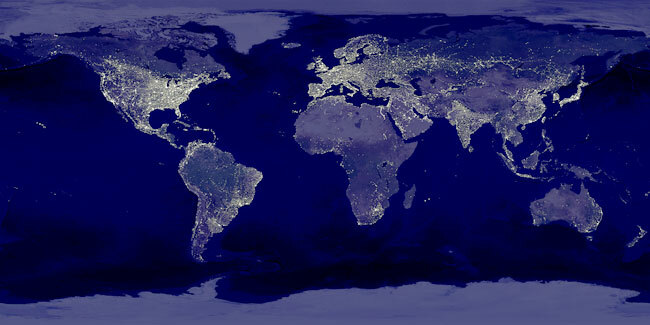 ESO has made it possible to fly around and into this detailed image by clicking here. What type of cloud is that? It is not a naturally occurring one. Looking perhaps a bit like a gigantic owl monster, the cloud pictured above resulted from a series of flares released by an air force jet over the Atlantic Ocean in May. The jet that released the flares, a C-17 Globemaster III, is seen on the right. 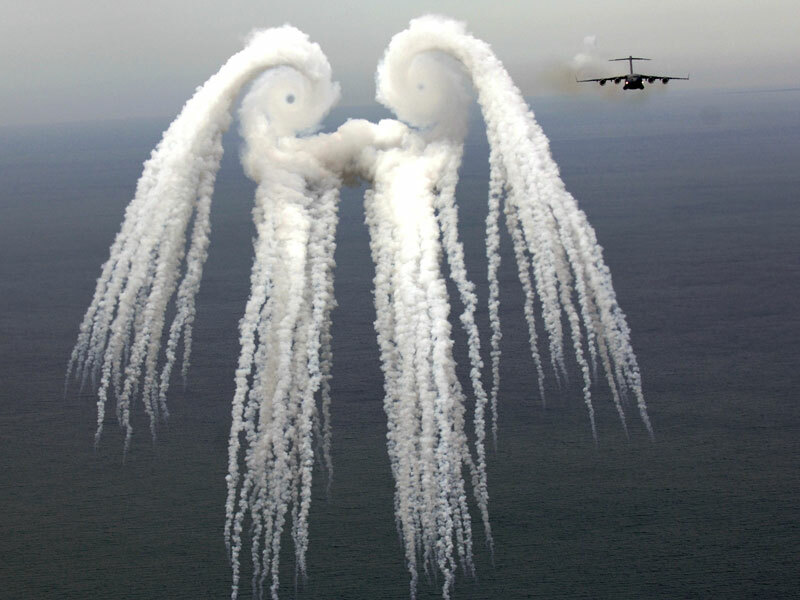 The flares release smoke and the resulting pattern is sometimes known as a smoke angel. The circular eyes of the above smoke angel are caused by air spiraling off the plane's wings and are known as wingtip vortices. Sometimes on Mars, there is nothing to see but red sand. Traveling two kilometers south of Endurance Crater, the robotic rover Opportunity now exploring Mars stopped and took a 360 degree panorama of a desolate and rusted Martian landscape. The site was dubbed Rub al Khali for its similarity to a barren part of the Saudi Arabian desert on Earth. In the center of the frame, the tracks from the rover's grated wheels can be seen receding far into the distance. Near the bottom, several parts of Opportunity itself are recorded, including, on the far right, a Martian sundial. 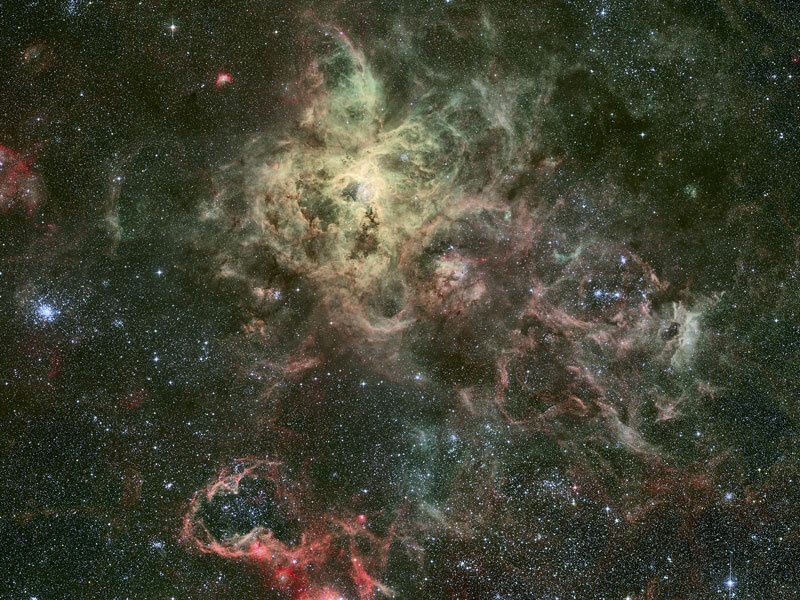 Nearly 100 images in three colors to generate the above spectacular real-color image mosaic. To display the full high-resolution image would require about 300 computer monitors -- or one good large format printer. As the Sun sets, the Earth's shadow rises up from the east. The subtle beauty of this daily apparition is often overlooked in favor of the brighter, more colorful western horizon. 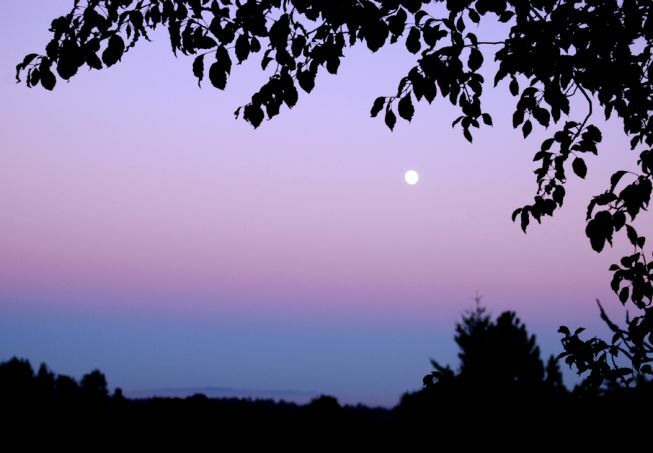 But while gazing toward a nearly full rising Moon on August 9, astronomer Steve Mandel admired the shadow rise from his driveway near Soquel, California, USA. His view looks east from the northern tip of Monterey Bay toward Fremont Peak, the highest point in the small mountain range on the horizon. The Earth's rising shadow is cast through the dense atmosphere and is seen in his picture as the dark blue band along the horizon, bounded above by a pinkish purple glow or antitwilight arch. Also known as the Belt of Venus, the arch's lovely color is due to backscattering of reddened light from the setting Sun. Featured in color in yesterday's episode, big, beautiful, face-on spiral galaxy NGC 300 is seen here through a narrow filter that transmits only the red light of hydrogen atoms. Ionized by energetic starlight, a hydrogen atom emits the characteristic red H-alpha light as its single electron is recaptured and transitions to lower energy states. 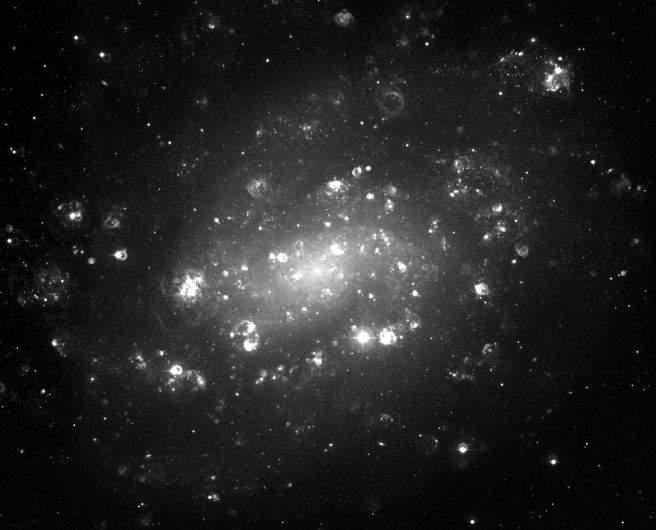 As a result, this image of NGC 300 is dominated by regions filled with massive, young stars and shell-shaped clouds of hydrogen gas hundreds to thousands of light-years across. Formed in groups called OB associations, the stars are likely only a few million years young. The hydrogen clouds are glowing nebulae or HII regions that have been sculpted by the strong stellar winds and ultraviolet radiation. While picking out your favorite cosmic shell in this picture, don't be misled by the relatively bright foreground stars located in our own Milky Way galaxy. They often show spikes and rings caused by the telescope and camera system. Edge-on spiral galaxy NGC 3079 is a mere 50 million light-years away toward the constellation Ursa Major. Shown in this stunning false-color Hubble Space Telescope image, the galaxy's disk - composed of spectacular star clusters in winding spiral arms and dramatic dark lanes of dust - spans some 70,000 light-years. Still, NGC 3079's most eye-catching features are the pillars of gas which tower above a swirling cosmic cauldron of activity at the galaxy's center. Seen in the close-up inset at lower right, the pillars rise to a height of about 2,000 light-years and seem to lie on the surface of an immense bubble rising from the galactic core. Measurements indicate that the gaseous pillars are streaming away from the core at 6 million kilometers per hour. What makes this galaxy's cauldron bubble? Astronomers are exploring the possibility that the superbubble is formed by winds from massive stars. If so, these massive stars were likely born all at once as the galactic center underwent a sudden burst of star formation. 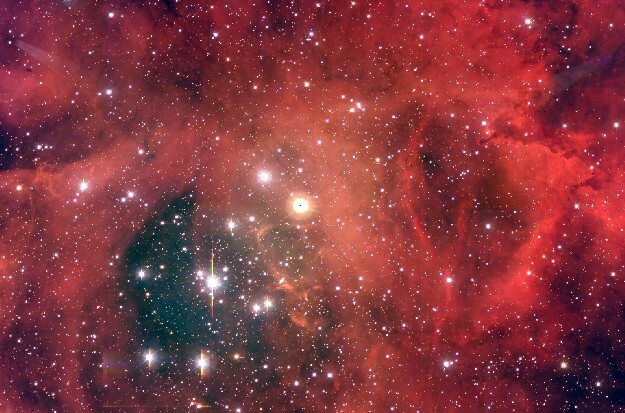 In the heart of the Rosette Nebula lies a bright open cluster of stars that lights up the nebula. The stars of NGC 2244 formed from the surrounding gas only four million years ago and emit light and wind that define the nebula's appearance today. High energy light from the bright young stars of NGC 2244 ionizes the surrounding hydrogen gas clouds to create the red emission nebula appearance. The hot wind of particles that streams away from the cluster stars contributes to an already complex menagerie of gas and dust filaments while slowly evacuating the cluster center. NGC 2244 measures about 50 light-years across, lies about 4500 light-years away, and is visible with binoculars towards the constellation of Monoceros. A fantastic jumble of young blue star clusters, gigantic glowing gas clouds, and imposing dark dust lanes surrounds the central region of the active galaxy Centaurus A. This mosaic of Hubble Space Telescope images taken in blue, green, and red light has been processed to present a natural color picture of this cosmic maelstrom. 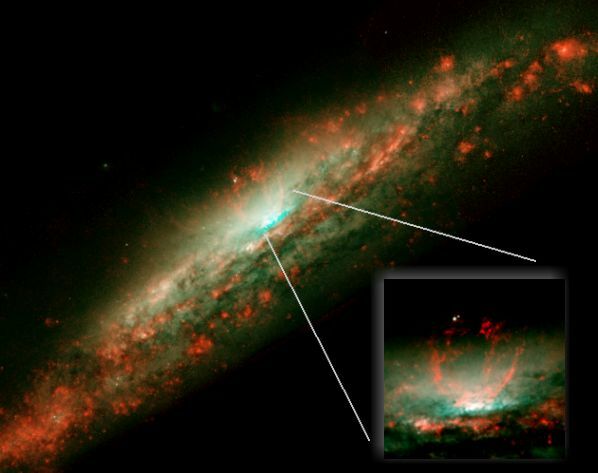 Infrared images from the Hubble have also shown that hidden at the center of this activity are what seem to be disks of matter spiraling into a black hole with a billion times the mass of the Sun! Centaurus A itself is apparently the result of a collision of two galaxies and the left over debris is steadily being consumed by the black hole. Astronomers believe that such black hole "central engines" generate the radio, X-ray, and gamma-ray energy radiated by Centaurus A and other active galaxies. 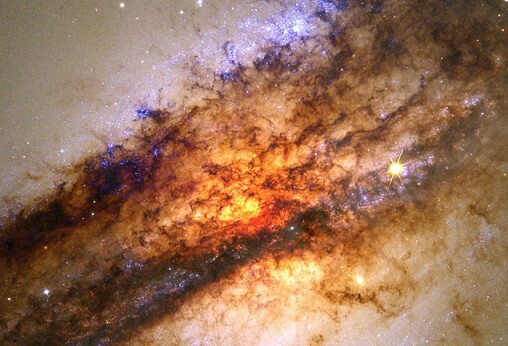 But for an active galaxy Centaurus A is close, a mere 10 million light-years away, and is a relatively convenient laboratory for exploring these powerful sources of energy. The awesome spectacle of starbirth produces extreme stellar winds and intense energetic starlight -- bombarding dusty molecular clouds inside the Lagoon Nebula (M8). At least two long funnel shaped clouds, each roughly half a light-year long, have apparently been formed by this activity. They extend from the upper left of this close-up of the bright area of the Lagoon known as 'the Hour Glass'. Are these interstellar funnel clouds actually swirling, twisting analogs to Earthly tornados? It's possible. As energy from nearby young hot stars, like the one at lower right, pours into the cool dust and gas, large temperature differences in adjoining regions can be created generating shearing winds. This picture is a reprocessed HST image made in 1995 as researchers explored this nearby (5,000 light-year distant) starforming region which lies in the direction of Sagittarius. Spiral arms aren't just for galaxies. A hot disk of gas surrounding a compact white dwarf star in the constellation of Pegasus has recently been revealed to be imprinted with this dramatic pattern. The white dwarf is part of the interacting binary star system IP Pegasi and the disk of gas is an accretion disk formed of material lost from a companion star and falling toward the white dwarf. The disk itself is smaller than the Sun's diameter, so the spiral pattern can not be imaged directly by telescopes. Instead, the spiraling disk of gas is mapped over a series of observations using a spectroscopic technique known as doppler tomography. The left panel above shows a tomogram, the directly measured gas velocity map for the system. The relative brightness corresponds to the intensity of light emitted by Hydrogen gas moving at the indicated velocity. The position at the center of this panel represents the velocity of the binary system's center of mass. In the middle panel, a simple model velocity field consistent with the measurements is shown. At the right, the calculated position map of the IP Pegasi accretion disk reveals a striking two armed trailing spiral pattern. Arp 230: Two Spirals in One? Is this one galaxy or two? Analysis of Arp 230 has shown evidence that this seemingly single spiral galaxy is actually the result of the recent collision of two spiral galaxies. The slow motion collision took place over about 100 million years and induced a burst of star formation that has begun to subside. The collision apparently had many similarities to the colliding galaxy sequence in the IMAX movie "Cosmic Voyage." The surface of Venus is perpetually covered by a veil of thick clouds and remains hidden from even the powerful telescopic eyes of earth-based astronomers. However, using an imaging radar technique, the Magellan spacecraft was able to lift the veil from the Face of Venus and produce spectacular high resolution images of the planet's surface. The bright area running across the middle of this picture represents the largest highland region of Venus known as Aphrodite Terra. The large highland regions are analogous to continents on Earth. Scientists are particularly interested in exploring the geology of Venus because of its similarity to Earth. For more information about Venus and this image see the Overview of Venus.